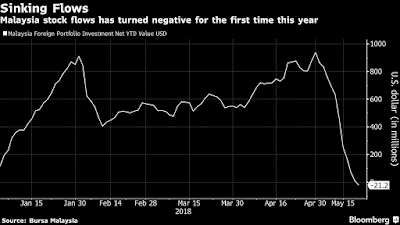 While locals in Malaysia cheer the ouster of the Barisan Nasional coalition for the first time since independence, foreign stock investors are voting with their feet. 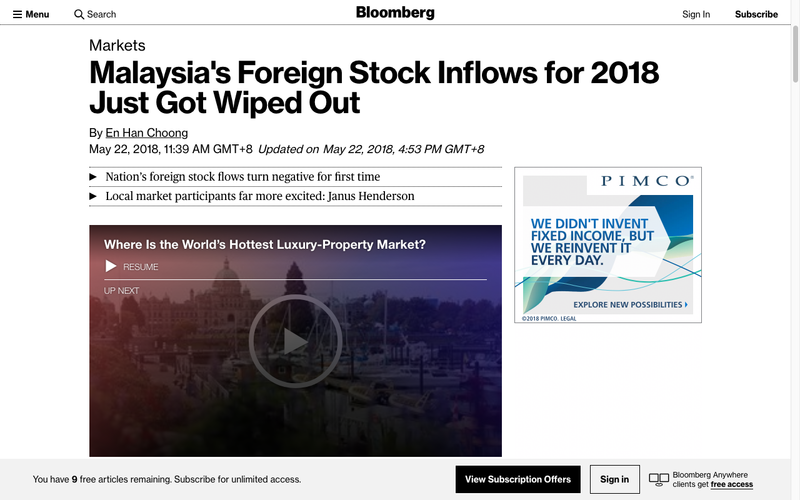 Foreign inflows into the local stock market of $937.8 million were wiped out as concern remains on how the new coalition party under 92-year-old Mahathir Mohamad will continue economic growth. As of May 21, foreign outflows from stocks stood at $21.2 million, after overseas investors sold a total of $949 million worth of stocks in 11 straight days. The nation had recorded inflows of as much as $2.4 billion in 2017. The benchmark FTSE Bursa Malaysia KLCI Index fell 0.5 percent Tuesday. 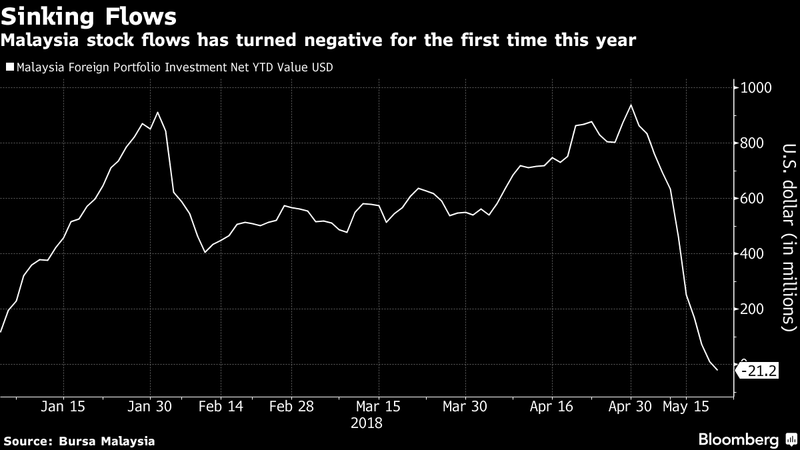 While the market has maintained its calm by gaining 0.4 percent last week after the election outcome, foreign investors are less sanguine about the nation’s outlook. Local funds and retail investors have been plowing money into stocks by buying 2.5 billion ringgit worth of equities as foreigners exit. The FTSE Bursa Malaysia KLCI Index is trading at 16.1 times its 12-month forward earnings, compared with a five-year average of 15.8 times. For Asia Pacific investors like Duhra, he said elections in Indonesian and India were far more exciting with breakthrough events such as Jokowi becoming the first non-military Indonesian leader in years and Indian Prime Minister Narendra Modi the first real non Nehru or Gandhi dynasty member for years. Even so, Duhra is tactical overweight on Malaysian banks as the surging oil price has benefited the only net oil exporter in the region. A recovering ringgit has also boosted margins and the non-performing loans outlook of Malaysian banks. In Mahathir’s first week in office, he has moved swiftly to fulfill campaign promises after last week’s election win, effectively scrapping a goods-and-services tax without announcing specific measures to recoup revenue losses. This was greeted with caution by credit ratings companies. Moody’s Investors Service labeled the move “credit negative”. “Malaysia is not even close to being a transformational election," Duhra said. "If you strip out the noise about 1MDB, which rightly is getting people excited, there is not that much under the surface." Former Prime Minister Najib Razak is at the center of investigations looking into the 1MDB sovereignty fund and whether it was used for embezzlement or money laundering.